Until recently, not much was known about the Marvel camera or the maker because of the lack of advertising and catalog references. Then in the summer of 1999, I acquired what appeared to be a Marvel catalogue issued by Franklin Putnam. For the first time, we learned that "F" stood for "Franklin." But what looked like a catalogue was actually a brochure that enticed "young men" to purchase Putnam's camera outfits and set up a photography business. Putnam's mid-1880s Descriptive Circular of Home Photography and Portable Photographic Outfits is likely the first sales brochure that described how to set up a photographic franchise. A camera outfit, complete with instructions, could be purchased from Putnam. Putnam continued to make money by selling darkroom chemicals, paper, and other necessities. This is the same concept governing franchise operations today. Not even George Eastman practiced the "become a professional photographer in a week" gimmick to gain business. Putnam's unique approach to selling his outfits is probably unique in the history of 19th century photographic retailing. The story of uncovering the legacy of Putnam and Marvel cameras started in 1998. Fellow collector Ben Ehrman and I were discussing items in our collections and discovered that we both had examples of the 5x8 Marvel by F. Putnam. We mused about finding these cameras curious, not because of the cameras themselves, but because of the mysterious "F. Putnam" moniker and the engaging name of "Marvel" stamped into the cameras. Actually, we think the exact words were, "Who the hell was Putnam?" After acquiring the "Descriptive" brochure, and a year of diligent investigation, Ben and I managed to uncover a great deal of information that could answer almost all questions about Putnam and his cameras. In September 2000, we published a monograph entitled Franklin Putnam and His Photographic Apparatus in the Cascade Panaorama photographic journal (published by the Cascade Photo Historical Society). Finally, we learned the truth about Putnam and his cameras. To our knowledge, no photograph of Franklin Putnam exists. We do not know the dates of his birth or death but two documents state that he was raised in a "pretty rough farm district" and "I worked eight whole months on a farm for only $100." The monograph is too lengthy to publish on this website, but I am pleased to present some of the most important highlights uncovered from the research. The most popular opinion held by collectors is that Marvel cameras were privately labeled Waterbury View cameras made by the Scovill Manufacturing Company in the 1880s. As shown below, the Marvel camera (right) exhibits roughly the same dimensions and design as a Waterbury (left) and is almost always found with a brass Waterbury landscape lens. In addition, manufacturing serial numbers on the body, focusing rails, rear standard, and lensboard are placed in the same location as those found on a Waterbury View camera. If it looks like a duck, quacks like a duck, must be a duck ... or in this case, a Waterbury. However, our research concludes that the Marvel camera is something other than a Waterbury. This is based on differences found in the physical construction, wood finish, and the brass hardware components. For example, Waterbury cameras are built with matching mahogany colored and grained wood parts while wood used to construct Marvel cameras have a wide array of colors and grain patterns. 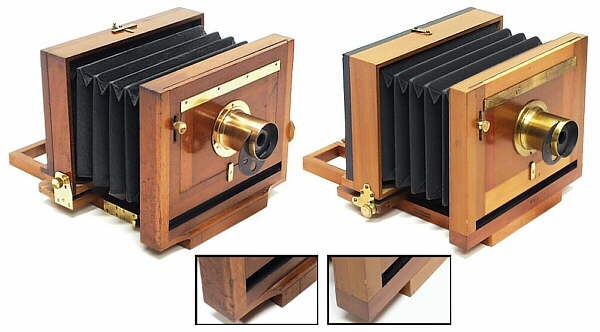 It is not unusual to find a Marvel camera with a deep mahogany colored piece of wood glued to a "greenish" looking wood part. The satin wood finish on a Marvel appears to be varnish while the Waterbury's refined glossy finish is likely a lacquer. In addition, the Waterbury View camera's front standard has an aesthetically pleasing scalloped shape (left inset) where it attaches to the base. In comparison, the Marvel is perfectly flat (right inset). Brass hardware components also exhibit differences. 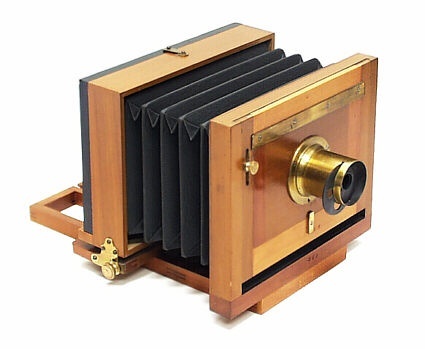 On the Waterbury camera, two brass hinges connect the ground glass frame to the body. Conversely, the Marvel camera does not use hinges, and as a result, the ground glass frame is completely removed from the body when attaching a plateholder. Closer examination of the Scovill catalogue of photograph apparatus uncovered a wood tailboard camera called the Favorite. Comparing advertisements and examples in collections, we discovered the Marvel and Favorite to be identifical in all regards. The primary difference was that Putnam stamped "Marvel" and "F.Putnam, New York" into the wood. Further proof was found in another collection that had a Marvel camera with a "Scovill" overstrike. 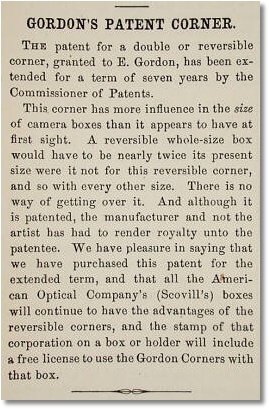 This final piece of evidence proved that the Marvel camera was built in an American Optical or Scovill factory. Interestingly, Putnam resold almost the entire Scovill photographic catalogue. And much to our surprise, Putnam privately labeled several more of Scovill's cameras including two detective cameras (Scovill's Antique Oak Detective and Empire Hand Camera) and a 4-tube ferrotype camera that is identical to Scovill's Ferrotype Bon Ton View Box.